At the suggestion of Lucian Freud, a friend of the painter, Baron Thyssen commissioned Michael Andrews (whose "Portrait of Timothy Behrens" he already owned) to paint Daylesford, his country house in the country of Gloucestershire in southern England. Andrews was fascinated by the associations to be discovered in a subject. 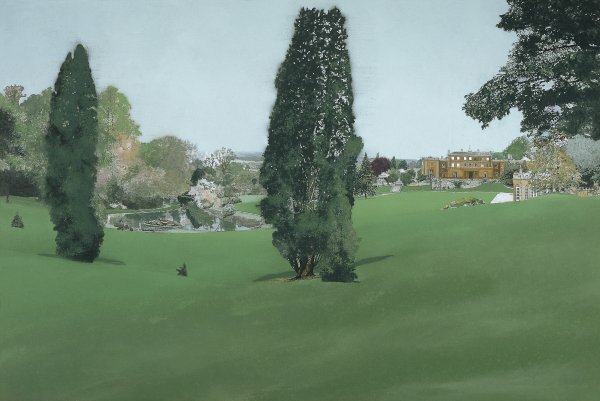 What may initially appear to be an almost bland depiction of a fine house set in handsome grounds, acres of immaculately mown lawn and an encyclopaedic variety of trees, proves to be an organised view of a complex landscape. Working from photographs and drawings the artist modified the scene, pruning the foreground conifer to suit the painting and gradually clarifying and filling in the necessary details. Daylesford was built around 1788 by Warren Hastings using the local honey-coloured Cotswold stone. Hastings was a self-made man, the former Governor-General of Bengal and chief creator of the British Empire in India. He bought the Daylesford estate from a Bristol merchant because it had previously belonged to his family and the new house thus proclaimed him a man of wealth and achievement restored to his ancestral lands. At the same time, however, a campaign was launched by his political enemies to impeach him for corruption, extortion and crimes against the Indian people. His trial lasted seven years and he was eventually acquitted and retired to Daylesford, where he died in 1818. The painting celebrates the tranquility and elegance of the house and its setting. Down by the ornamental lake a gardener discreetly attends to the tidying of the grass verges and a man walks past him, hands in pockets, too small to be identified, though his gait and dress suggest that he could be Andrews himself, prospecting for a good viewpoint. This is characteristic of Andrews: the mild, conventional approach and widening ripples of implication. Subtly, exquisitely, using a spray gun and acrylic paint, he wafted nuances into the scene. Behind the blank windows of the house are private histories, some of which, in Hastings' time, became notoriously public. The lawns, with their concealed slopes and folds, the curving lake and the carefully disposed trees, are so shaped and arranged as to be, in effect, an 18th-century composition. Andrews here pays tribute to the English art of landscape design. Nothing happened, just as in Daylesford nothing happens. Daylesford, like delstrop, is a perfectly encapsulated memory.